This Round Photo Pendant, a classic piece at Apples of Gold, combines a stunning color photos with the shine and luster of yellow gold. 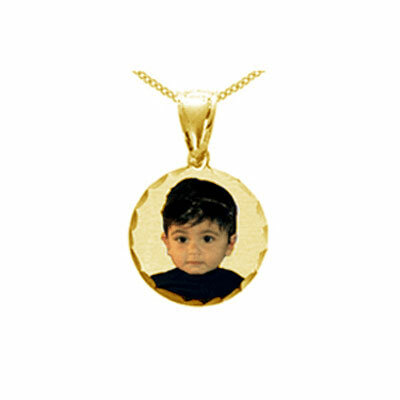 You can choose what photo you want in the pendant and can choose from 14k and 18 gold. The pendant is 5/8inch and looks great with casual, business, or formal wear. Get the beauty and brilliance that comes only from the finest quality gold. Apples of Gold specializes in fine jewelry and designs and they are waiting for you to discover the elegant charm of the Round Yellow Gold Color Picture Necklace Pendant! Turn heads with this shimmering pendant and show to the world what is held closest to your heart. We guarantee our Round Yellow Gold Color Picture Necklace Pendant to be high quality, authentic jewelry, as described above.